What are some details of David Hume’s life and career? In hopes of greater recognition (Hume was consumed by what he called “love of literary fame”) he composed An Abstract of a Treatise of Human Nature, which was anonymously published in 1740. His next major philosophical work was Philosophical Essays concerning the Human Understanding (1748), which was retitled An Enquiry Concerning the Human Understanding (1758). Then came An Enquiry Concerning the Principles of Morals (1751). The Enquiry was more explicitly anti-religious than the Treatise. His Dialogues Concerning Natural Religion was probably written during the 1750s, although published posthumously. 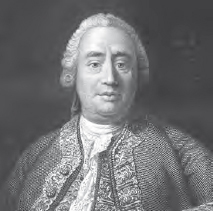 With his philosophical research complete, Hume applied himself to history (his History of Great Britain won him great fame and acclaim), economics, ethics, and political philosophy. However, he also tried, although without success, to secure the position of chair of philosophy at the universities of Edinburgh and Glasgow. He was appointed secretary to General St. Clair for three years in 1746, which led him to Brittany and Turin; and he was in charge of the Advocates Library in Edinburgh for five years, beginning in 1752. He was then private secretary to the British ambassador in Paris and undersecretary of state. David Hume, depicted in this 1854 engraving, sought to create a science of the mind (iStock).